After each Patriots game, I'll be taking a look at the game film via NFL Game Rewind and posting my observations. 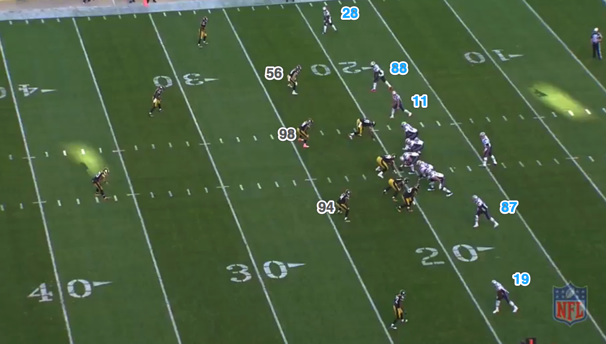 Here's a closer look at how the Patriots used their versatile personnel to consistently keep the Steelers defense mismatched throughout Sunday's win. Make no mistake about it, the Patriots offense wouldn't be close to as prolific as it's been without great personnel. You need playmaking mismatch creators from your skill positions to move the ball consistently against NFL defenses, and the Patriots were already loaded in that department before the acquisitions of Martellus Bennett and Chris Hogan. However, the extra edge that has made the Patriots such a nightmare to defend has been their multiplicity. Both Rob Gronkowski and Bennett can be effective lined up just about anywhere on the field- split out wide, in the slot, on the wing, or on the line of scrimmage with a hand in the dirt. 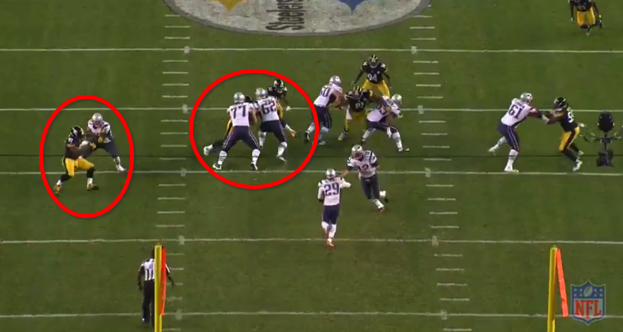 Gronkowski even motioned from out of the backfield into the slot on one snap against Pittsburgh. What's more, both players are major assets as run blockers. I highlighted the versatility of the two tight ends and the options they open up for the offense three weeks ago in this very column. That was following the Cleveland game, Tom Brady's season debut, which offered the first glimpse of the matchup problems that combination could have. In that game, the Browns opted to matchup with the two tight end package by selling out to stop the run and keeping their base defense on the field. They managed to stop the run, but Brady carved them up with explosive play after explosive play in the passing game as the Patriots rolled. While the hapless Browns weren't the most challenging opponent, that game was a good illustration of the pre-snap predicaments the Pats versatile personnel regularly puts their opponent in. The Pats can put running personnel on the field, only to motion into a passing formation before the snap. They can put running personnel on the field and line up in a running formation, only to throw a play action pass over the top. They force you to make a concession before the snap- lining up in base defense leaves you short on coverage options, lining up in nickel leaves you vulnerable against the run - and have the personnel to make you pay regardless of what you choose. The Patriots offensive start on Sunday was a perfect example of how they can effortlessly keep a defense off-balance. Their first offensive snap saw them line up in a two tight end set, with Gronk in a 3 point stance on the right and Bennett on the left wing, just offset from Nate Solder. With LeGarrette Blount in the backfield, that was a definitive run look for Pittsburgh's defense, who lined up with their base defense. The Pats, of course, ran play action on first down, with Brady taking advantage of Pittsburgh's soft zone coverage to hit a wide open Chris Hogan for 12 yards. This would have been a fine drive starter had Hogan not coughed up the football after turning up field. Undeterred by the early turnover, the Pats entered their next possession armed with the knowledge that Pittsburgh would match up with their two tight end package with base defense. They entered the huddle with both tight ends, a running back (James White) and two receivers (Julian Edelman and Malcolm Mitchell, who was replacing Hogan following his fumble). Pittsburgh predictably countered with their base defense, which the Pats immediately turned against them by going with a spread formation. As you can see, the Steelers are in some serious matchup trouble here. With their two corner backs taking the outside "receivers" (White and Mitchell) and the safeties protecting deep, they are left with three linebackers to cover the Pats top three passing weapons in Bennett, Edelman and Gronk. None of those are favorable one-on-one matchups and they only have enough men to help on two of them. If that wasn't enough, the play design helps to stress the coverage even more. Mitchell, Gronkowski and Bennett all run vertical routes, clearing out the middle for Edelman to run a quick crossing route. With Gronk and Bennett each having clear speed advantages against linebackers Lawrence Timmons and Anthony Chickillo, both safeties are forced to give help over the top against Gronk's seam route and Bennett's backside post. 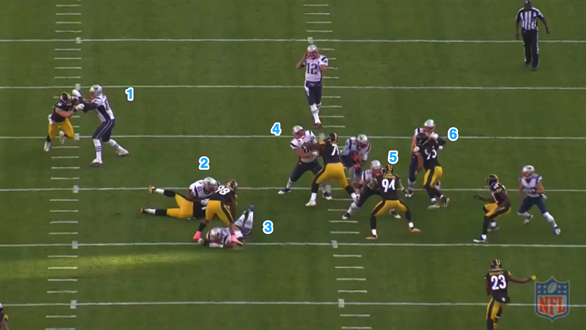 This leaves poor Vince Williams, at 6'1" and 233 pounds, stuck in one-on-one coverage against Edelman in space. Williams actually does a commendable job of sticking with Edelman and making the tackle to limit his yards after the catch, but that's still an easy completion and a nine yard gain on first down. That was also a matchup the Pats would exploit time-after-time throughout the game. Edelman caught nine of his 10 targets in the game, with the only incompletion coming on a bad, third-down drop. 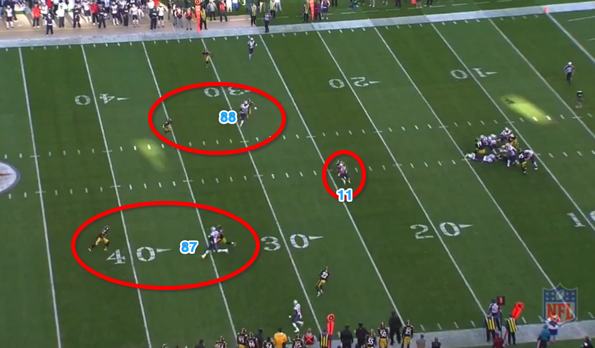 Time after time, the Patriots were able to clear out the middle of the field and create an Edelman vs linebacker one-on-one matchup. The fact that those catches totaled only 60 yards is a testament to the Pittsburgh linebackers, who did a fantastic job of staying with him and making their tackles immediately after the catch (Edelman finished with a long gain of just 11 yards). However, the efficiency with which Brady and Edelman operated was ruthless, as they were able to create that matchup and gain an easy seven or eight yards pretty much whenever they wanted two. Those gains allowed the offense to consistently stay in good situations, away from drive killing third and longs. That initial Edelman completion set up a second-and-one, which was converted easily with a Brady QB sneak. The ensuing first down play saw the Patriots find another mismatch that they would attack with impunity the rest of the day. This time, the Patriots kept just one tight end on the field (Gronk, lined up in-line on the right), with three receivers (Edelman, Mitchell and Danny Amendola). The Steelers countered with their nickel package, taking out a linebacker to add a third cornerback on the field. As you can see from this end-zone angle, the Pats are now in an inviting situation to run. 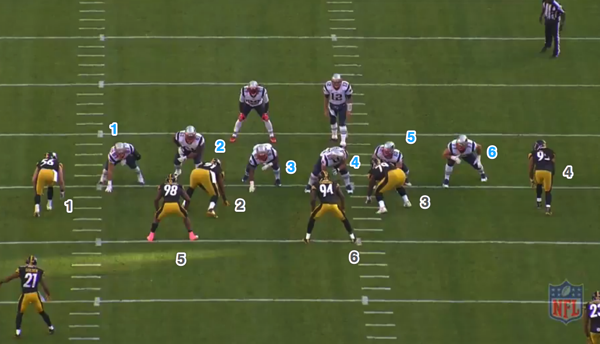 With Gronkowski as an extra blocker and the Steelers keeping only six men in the box, the Pats now have a blocker to account for every run defender remotely close to the line of scrimmage. If they can successful execute blocking to get a hat on a hat, there's potential for a good rushing gain here. The execution isn't perfect here, but it's good enough to combine with hard running from Blount to get a positive seven yard gain on first down. The key to this run is left guard Joe Thuney, who shows impeccable timing peeling off of his double team to get a body on linebacker Lawrence Timmons (#94) at the second level. That affords Blount enough space to get his legs churning downhill, even after cutting around David Andrews, who gets stood up at the line by defensive lineman Javon Hargrave (blocking matchup #4). 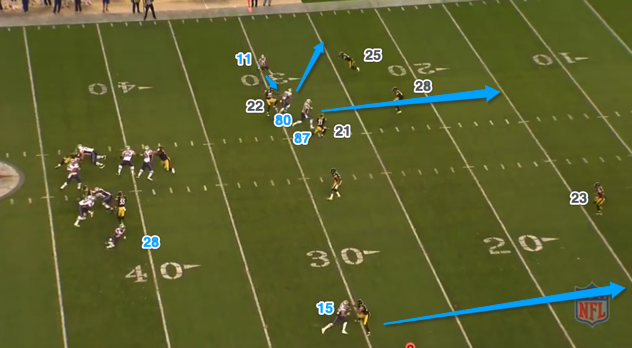 The Patriots went back to the well on the very next play, keeping the same personnel on the field, getting the same matchup, and once again running right into a lighter Pittsburgh front. This time, they run a trap play, with Gronk coming the left wing across the formation to land the "wham" block on Steelers defensive lineman Stephon Tuitt. That, along with Thuney and Nate Solder successfully sealing off the weakside, frees Blount to get through the line of scrimmage, but this play really takes off because of Andrews and Marcus Cannon. Both players fire out to successfully reach Pittsburgh's two second level linebackers, with Cannon's ability to drive his man out of his assigned lane particularly critical to Blount having space to attack downhill. It takes a strong one-on-one tackle from safety Mike Mitchell to keep this to just a gain of nine and a first down. The Pats clearly liked the matchups they were able to create out of their three receiver sets, as they went three wide on 26 of their 56 snaps. This was a major departure from previous weeks, when the two-tight end package served as a base offense. They went with multiple tight end sets on just 24 snaps, with five of those coming during the team's final two possession as the team attempted to bleed some clock with the running game. Martellus Bennett saw a season-low 30 snaps as a result, with Gronkowski generally played over him as the lone tight end in those three receiver packages. The on-field results backed up that strategy. The Pats had nine designed runs (excluding Brady's scrambles) out of the 3 receiver package, totaling 76 yards (8.4 yards per carry). 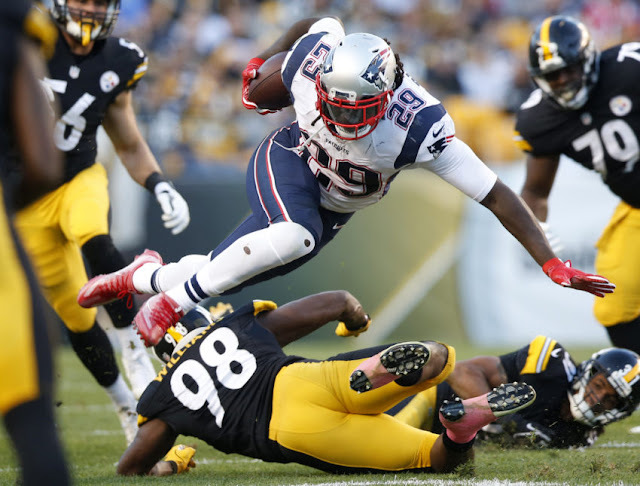 Their dominance running against Pittsburgh's nickel was a key to the game, as big runs by Blount against the Pittsburgh nickel helped jump-start back-to-back touchdown drives in the second half that put the game out of reach. The first of those touchdown drives saw the Patriots run all six plays out of that 11 (1 back, 1 tight end, 3 receiver) personnel set. The first play of the drive, an 11 yard Blount run, was a bit fluky, as Nate Solder appeared to get away with movement before the snap. 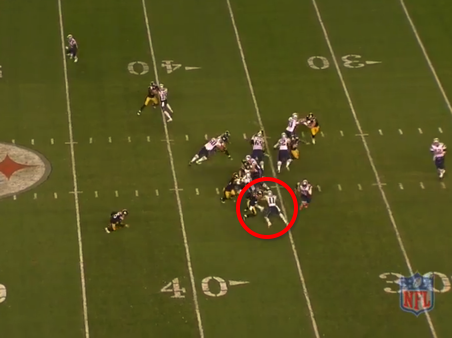 This led several Steelers to stand up and stop playing briefly, anticipating a flag. Blount still deserves credit for making linebacker Ryan Shazier miss in the hole (Shaq Mason missed him after pulling from the weak-side). There were no such excuses for the Steelers on the next snap, which was simply the result of well-executed blocking from the Patriots. The key block here was a double team by Solder and Thuney against Hargrave, who gets cleanly moved off the line of scrimmage. Gronkowski, as usual, does a great job securing the edge one-on-one against James Harrison, leaving a gaping hole for Blount to run through. That hole is extra inviting because playside linebacker Shazier shoots the A gap, where Thuney is able to peel off from his double team to pick him up. As you can see, Stephon Tuitt (#91) is actually in the process of splitting a double team from David Andrews and Shaq Mason, but their initial push off the line of scrimmage has made it impossible for him to get back into the play. Blount now has free reign to gallop into the secondary untouched. However, he gains an extra 10 yards due to the effort of Julian Edelman, who maintains his block long enough to not only prevent his man from the tackle, but also to cut off another secondary member's backside pursuit. The 25 yarder is Blount's longest run of the day, firmly establishing momentum back in New England's favor after a shaky start to the second half. Blocking from the Patriots wide receivers has been an understated factor in the team's improved rushing attack this year, and Edelman in particular deserves credit for his blocking work on Sunday. While his aforementioned block on the 25 yard run will probably get more notice, he might have had an even better one on the following possession, driving safety Robert Golden several yards back as part of an edge setting effort that helped spring Blount for another 11 yard chunk gain (on yet another run against the Steelers nickel). Check out the clean lane Blount had around the edge thanks to Edelman's grunt work here. Even with the Patriots dominating the Steelers nickel defense on the ground, Pittsburgh stayed in the nickel throughout the game. After all, the Patriots ample passing game weapons would destroy their base defense. Making things more painful for Pittsburgh was the fact that going nickel didn't particularly slow down the Patriots passing attack. Brady was still able to pick them apart with ease against extra defensive backs, with only the negative plays created by the Steelers productive pass rush slowing the Pats down. 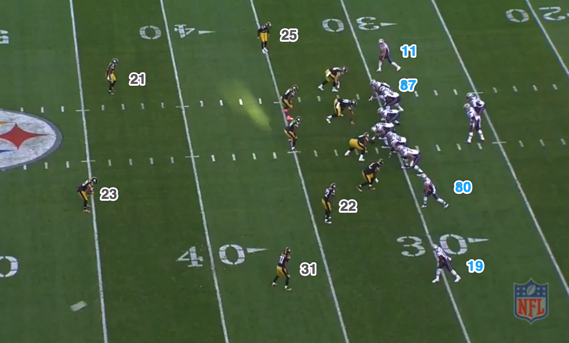 In fact, the deep touchdown to Gronkowski came against the Steelers dime package, with six defensive backs in coverage. With the Patriots facing a 3rd and 7, the Steelers subbed in an extra safety, rookie Sean Davis, with fellow safety Golden bumping down to a de-facto linebacker spot. The Steelers only rush four, leaving them with six defensive backs and uber athletic linebacker Shazier in coverage against the Patriots five pass catching options. Putting Golden at linebacker in theory makes putting a linebacker on Gronk more palatable, but Gronk still eats up the matchup, running right by the Steelers safety up the seam (he would later victimize Golden on their next possession for a 36 yard grab to set up another touchdown). This puts the Steelers defense in a huge conundrum. They aren't helped by an apparent miscommunication between cornerbacks William Gay (22) and rookie Artie Burns (25). Edelman breaks his route off on an in-cut, while Amendola keeps pushing up the field on a post, with that route combination eliciting confusion between the two. Burns, as you can see, is pushing forward in an apparent attempt to attack Edelman's route, while Gay appears to be passing Amendola's route onto the next man to pick up Edelman. Burns recovers barely in time to cut off Amendola's route (he arguably could have been penalized on the play), but the initial confusion seems to trigger a reaction from Davis, who rotates in the direction of Amendola's post. That drags him away from Gronk, who now has an easy step on the overmatched Golden. 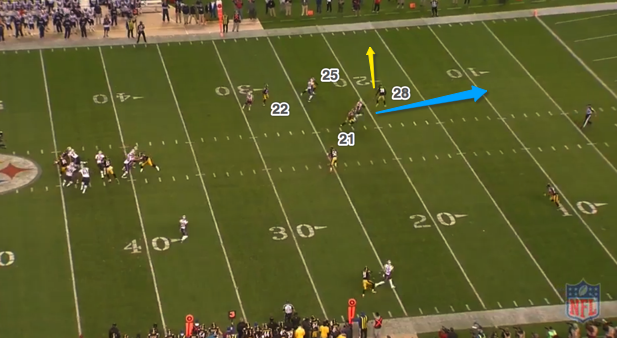 With veteran Mike Mitchell (23) drawn away from the play by a vertical route by Chris Hogan, there is no one left to help Golden. Brady hits Gronk in stride for the touchdown, and the Patriots never looked back. While obviously aided by defensive miscommunication, that play is a great example of how New England's personnel (and the way it's deployed) can stress a defense. No matter what a defense does, they will be leaving themselves vulnerable in some way, and you can bet that Tom Brady will figure out where the weakness is and how to attack it. As if to prove it, Pittsburgh sold out to stop the deep ball on that play, going to their dime package, but Gronk simply outran the defensive back to the end zone in a way a 6'7", 265 pound man shouldn't be able to. Talent like that would be successful regardless of how it's utilized, but the Patriots ability to consistently put it's personnel at an advantage before the snap is uncanny. That combination of talent and scheme is the biggest reason the Pats continue to be nearly unstoppable on offense, even on a day when they at times seemed determined to stop themselves with drops and fumbles.